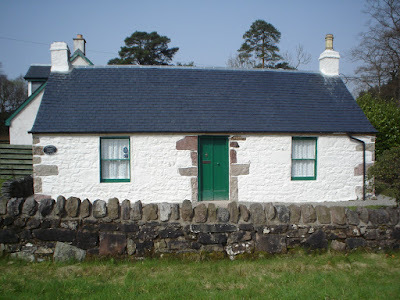 This traditional Scottish stone cottage offers you a unique chance to stay in an iconic local landmark with a 300 year history! Tasteful fixtures and decoration give the cottage today a fresh, modern and cosy ambience especially the original fireplace and wood burning stove. 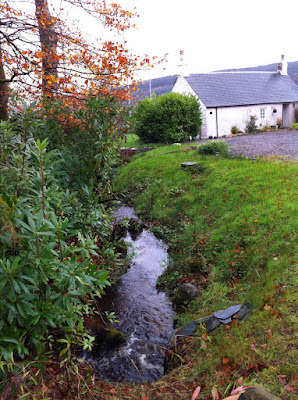 The cottage has its own grassy garden area with outdoor seating, BBQ and a view east towards the Kilpatrick Hills. The Cottage enjoys the early morning sun and views of the evening sun reflected on the hills & trees. Crosskeys cottage is all at ground floor level, with wooden floors and heated by electricity and a wood burning stove in the lounge. It comprises of a spacious double bedroom, lounge with dinning table, kitchen and bathroom. 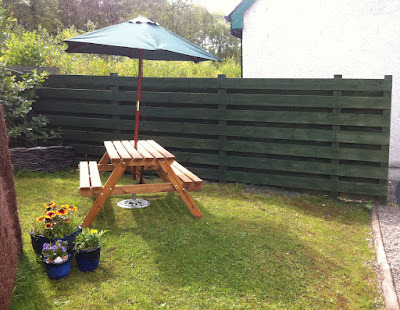 The cottage has an enclosed garden which includes a seating area and BBQ (coals not included). There is parking for 2 cars in a shared courtyard, which has a small stream running along it's boundary. You are welcome to bring your dog. Local amenities such as supermarkets, petrol, sports centre, pubs and restaurants are available in both Helensburgh (3 miles), Balloch (4 miles), Dumbarton (10 miles) and various locations along the loch side. Included in your stay is all your electricity, bed linen and towels. Logs/coal for the fire, can be provided at a cost of £12.00 per batch. A cot is also available on request. Check our availability calendar and make a booking to come and stay. Contact us to discuss any questions or requirements you may have.